Following the launch of the 2019 Triumph Scrambler 1200 XC and XE are the 2019 Triumph Street Scrambler and Triumph Street Twin, priced at RM64,900 and RM55,900, respectively. First appearing in Triumph’s Modern Classics range in 2016, the Street Scrambler and Street Twin have been updated, now coming with more power and torque. Displacing 900 cc, the parallel-twin Bonneville power plant installed in the Street Scrambler and Street Twin produces 65 PS at 7,500 rpm and 80 Nm of torque at 3,800 rpm. Coupled with ride-by-wire and a five-speed gearbox, the Street Scrambler and Twin come with new road and rain ride modes. A single four-piston Brembo brake calliper does duty on the front wheel, and a single two-piston calliper is fitted to the rear. This is coupled with switchable ABS on the Street Scrambler for off-road fun. Fuel is carried in a 12-litre tank for both Street models while the Street Twin weighs 198 kg dry while the Street Scrambler comes in at 203 kg. The round combination analogue/LCD instrument display remains the same but now comes with a gear indicator. Seat height is set at 786 mm for the Street Twin while the Street Scrambler puts the rider 790 mm off the ground. Colour options for the 2019 Street Scrambler are Fusion White, Cranberry Red and Khaki Green with Matt Aluminium while the Street Twin is available in Matt Ironstone, Korosi Red and Jet Black. 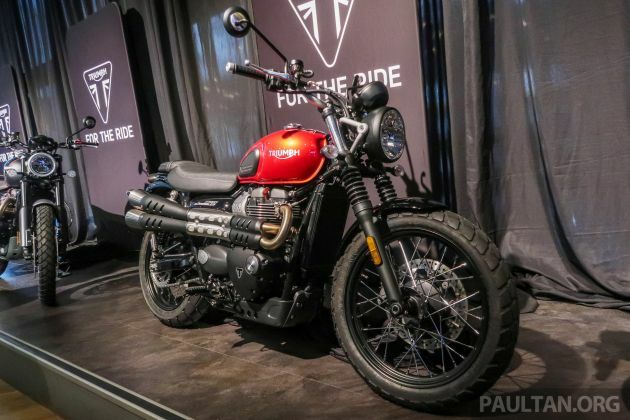 The post 2019 Triumph Street Scrambler and Street Twin arrive in Malaysia – RM64,900 and RM55,900 respectively appeared first on Paul Tan's Automotive News. 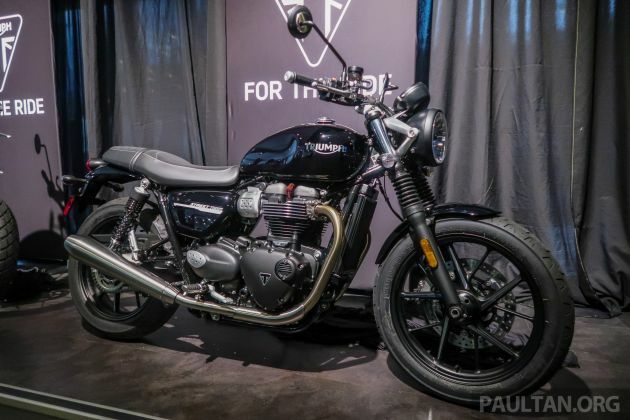 0 Response to "2019 Triumph Street Scrambler and Street Twin arrive in Malaysia – RM64,900 and RM55,900 respectively"